Bipartisan Congressional Health Policy Conference The State Childrens Health Insurance Program: Achievements and Opportunities for Improvement at Renewal. 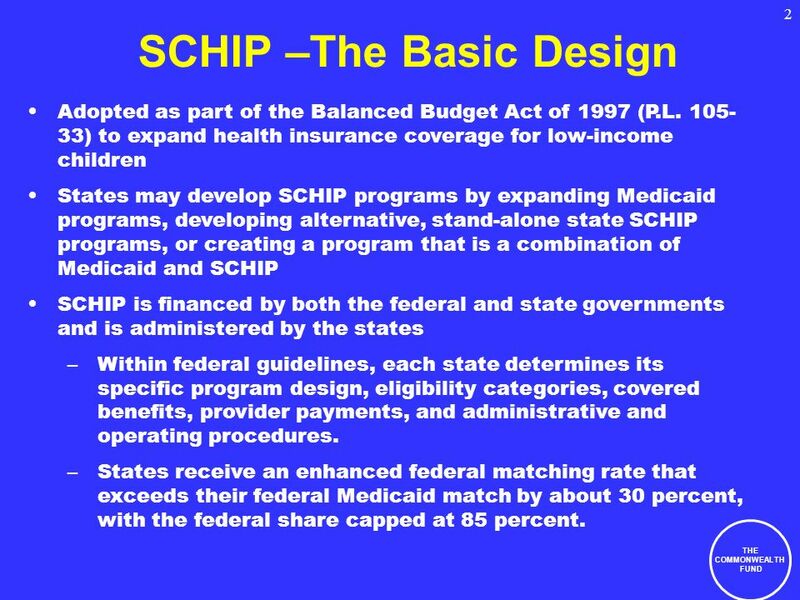 2 THE COMMONWEALTH FUND 2 SCHIP –The Basic Design Adopted as part of the Balanced Budget Act of 1997 (P.L. 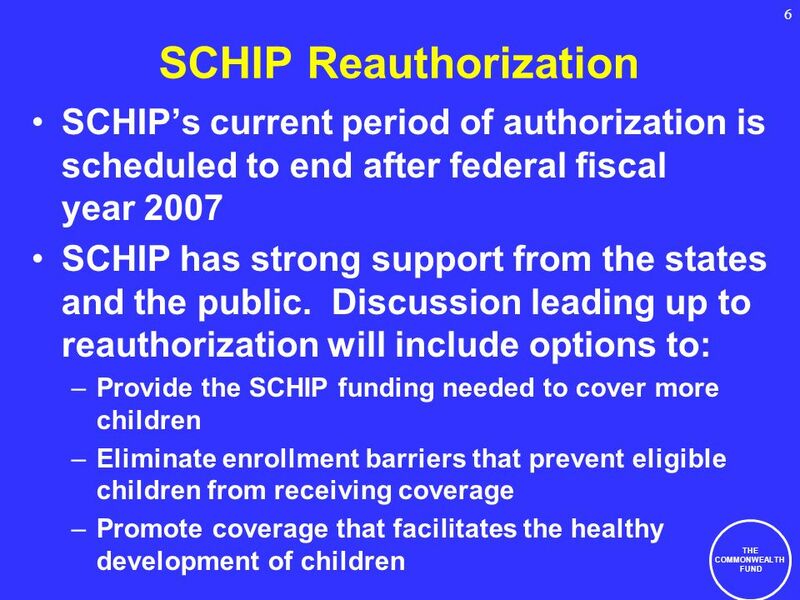 105- 33) to expand health insurance coverage for low-income children States may develop SCHIP programs by expanding Medicaid programs, developing alternative, stand-alone state SCHIP programs, or creating a program that is a combination of Medicaid and SCHIP SCHIP is financed by both the federal and state governments and is administered by the states –Within federal guidelines, each state determines its specific program design, eligibility categories, covered benefits, provider payments, and administrative and operating procedures. 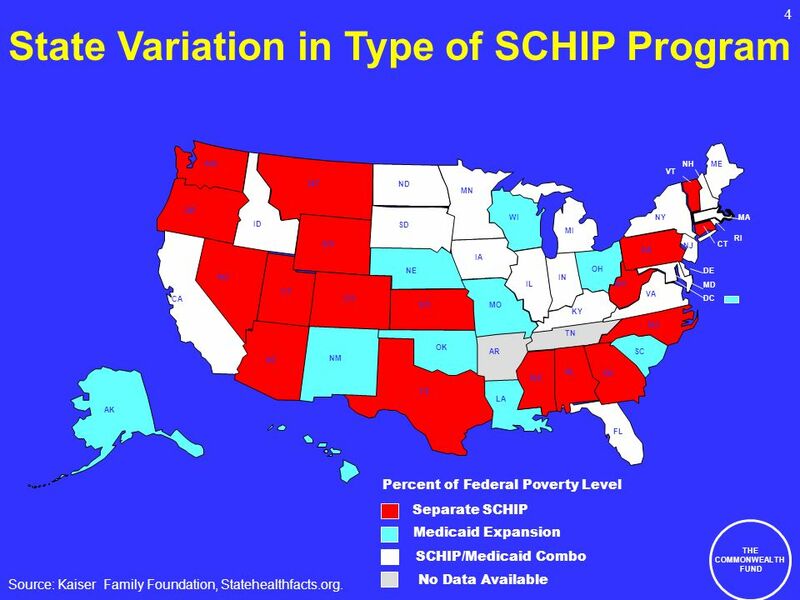 –States receive an enhanced federal matching rate that exceeds their federal Medicaid match by about 30 percent, with the federal share capped at 85 percent. 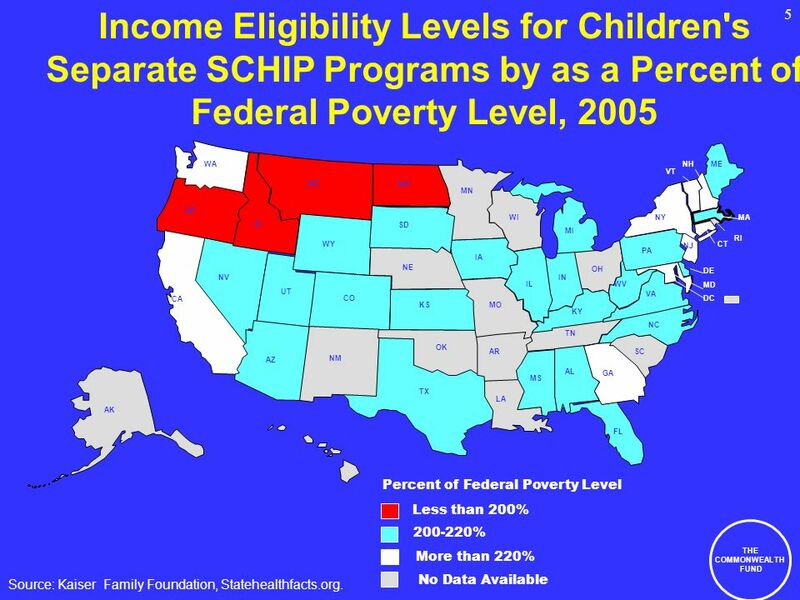 3 THE COMMONWEALTH FUND 3 U.S. SCHIP Enrollment of Children June of Each Year vs. 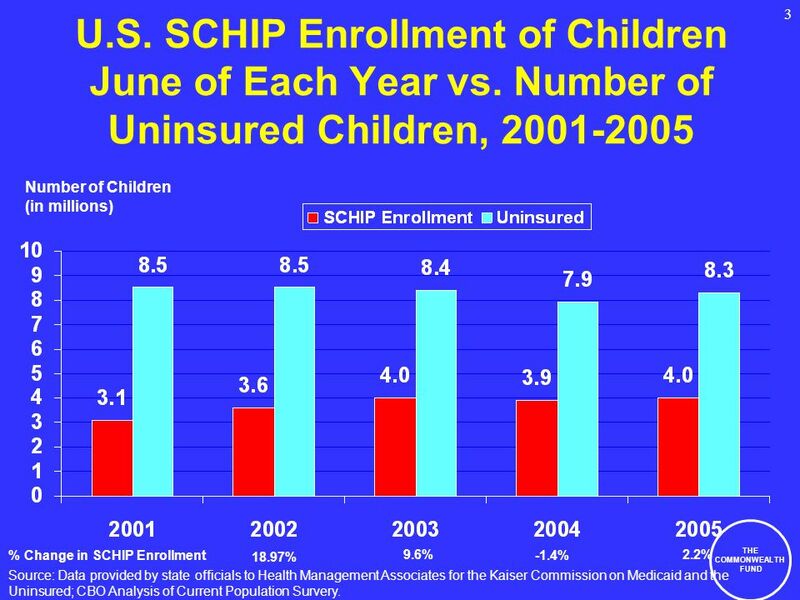 Number of Uninsured Children, 2001-2005 Number of Children (in millions) % Change in SCHIP Enrollment 18.97% 9.6% -1.4% 2.2% Source: Data provided by state officials to Health Management Associates for the Kaiser Commission on Medicaid and the Uninsured; CBO Analysis of Current Population Survery. 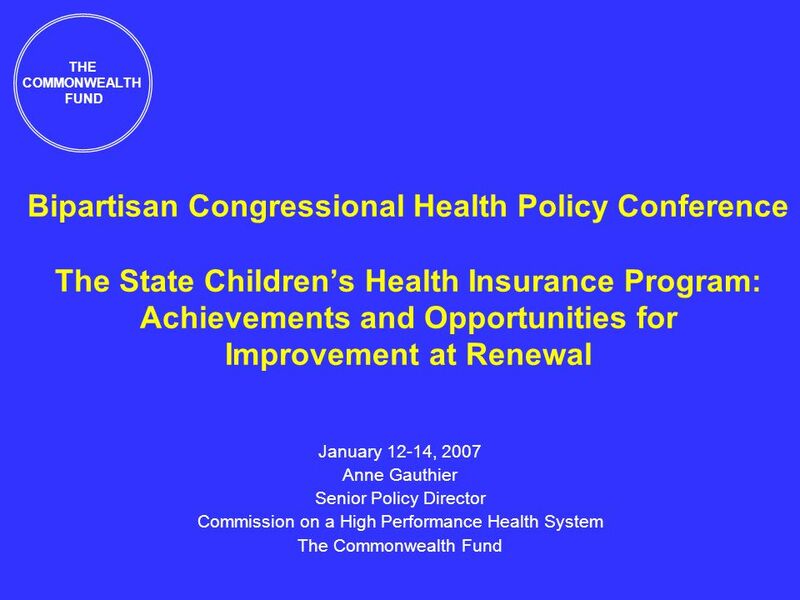 Download ppt "Bipartisan Congressional Health Policy Conference The State Childrens Health Insurance Program: Achievements and Opportunities for Improvement at Renewal." K A I S E R C O M M I S S I O N O N Medicaid and the Uninsured Figure 0 Health Reform Primer: Who are the Uninsured? Diane Rowland, Sc.D. Executive Vice. Implementing Commercial Insurance Market Aspects of Federal Health Reform: A State Perspective Christopher F. Koller Health Insurance Commissioner, State. 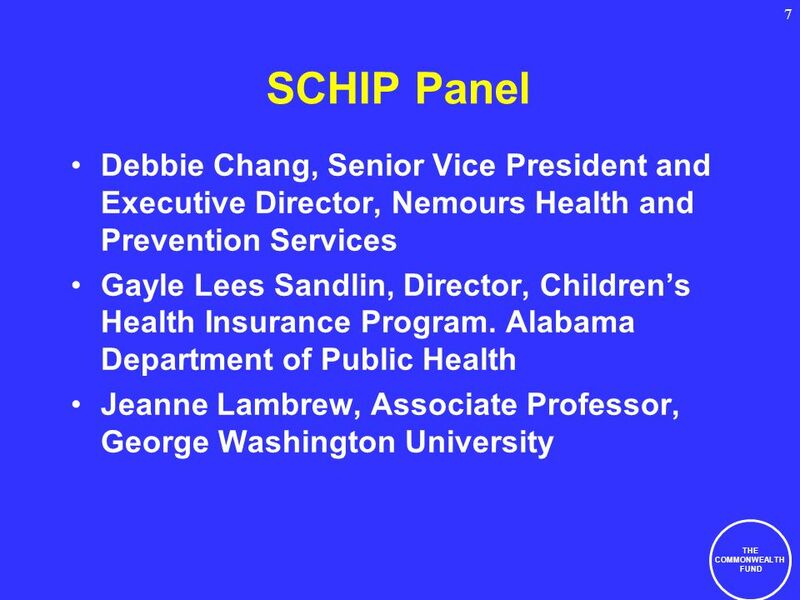 K A I S E R C O M M I S S I O N O N Medicaid and the Uninsured Figure 0 Childrens Coverage: The Role of Medicaid & SCHIP Diane Rowland, Sc.D. Executive. THE COMMONWEALTH FUND Enhancing Value in Medicare Stuart Guterman Senior Program Director Program on Medicares Future The Commonwealth Fund Bipartisan. DC Responses Received WA OR ID MT WY CA NV UT CO AZ NM AK HI TX ND SD NE KS OK MN IA MO AR LA WI IL MI IN OH KY TN MS AL GA FL SC NC VA WV PA NY VT NH. National Core Indicators Overview for the State of Washington Lisa A. Weber, Ph.D. Division of Developmental Disabilities. HIV in the Southern United States: Regional Challenges & Opportunities Jen Kates, PhD June 18, 2014 Vice President; Director, Global Health & HIV Policy. A Look at the Future of Children’s Health Insurance Coverage Joan Alker, Executive Director Georgetown University Center for Children and Families January. The Lifespan Respite Care Program: Current Status and Future Directions The Many Faces of Respite Lifespan Respite Conference Glendale, AZ November. Children’s Coverage: On the Move. Children’s Coverage: On the Move Cindy Mann, Executive Director Center for Children and Families Georgetown University. State Aging and Disability Policy: 50 years backwards, 50 years forward John Michael Hall, Senior Director of Medicaid Policy & Planning. Rachel B. Morgan RN, BSN, Health Committee Director National Conference of State Legislatures 10 th National Forum For Heart Disease & Stroke Prevention. Reforming State Long-Term Care Services and Supports Through Participant Direction NASHP State Health Policy Conference October 2010 Suzanne Crisp Director. Primary elections. Basics What is a primary? When did states start adopting primaries? Do all states use them today? What are some variations in primary.